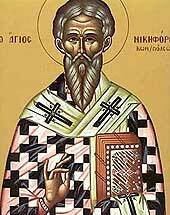 St Nicephorus, Patriarch of Constantinople (c. 758-829). He governed the holy Church with wisdom and zeal as the greatest arch-pastor of Constantinople. When Leo the Armenian made his stand against icons, he opposed the Emperor; first counselling him and then denouncing him. For this the accursed Emperor exiled him to the island of Prochonis. There was a monastery on that island, which Nicephorus himself had built in honour of St Theodore. And this confessor of the Orthodox faith spent thirteen years there, then died and went to the Lord in 827. Then all the iconoclast Emperors perished, and Michael, with his mother Theodora, came to the imperial throne in 842, and Methodius became Patriarch. Then, in 846, the relics of St Nicephorus were translated from Prochonnesus to Constantinople and placed first in the Church of St Sophia, from which he had been driven in his lifetime, and then in the Church of the Holy Apostles. The main commemoration of this great hierarch is on June 2nd, but on March 13th is commemorated the finding and translation of his uncorrupt relics. St Nicephorus was driven from Constantinople on March 13th, and on March 13th, nineteen years later, his relics were brought back to his patriarchal seat.